Your competent partner for organic retailers! Regional Organic Products, directly from the fields! 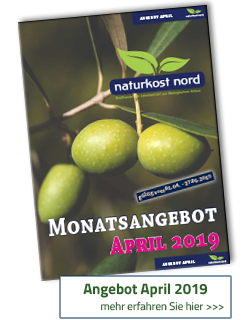 Become a Naturkost Nord customer today! We are your organic food wholesale company for the northern regions of Germany. We supply organic food retailers, farm shops, suppliers of local farmer’s markets, box delivery schemes for organic products, bulk consumers, as well as catering and restaurant businesses. Also with regards to cheese, milk or meat products, we offer huge variety and irresistible quality. Our range of organic dry foods accounts for over 4.000 items, well assorted and providing excellent value for money. Moreover - with our wide range of Demeter products, we are the leading wholesaler for Northern Germany! With 50 employees, we cater for your daily needs: You can reach us via email or speak to us personally over the phone. We are very happy to offer our expert advice to you; support you in the selection of suitable products; and fulfill your requests and special orders where necessary. Service Excellence is what we strive for, to guarantee a smooth process –and deliveries that will arrive on time. The vision we share with our customers is, to create a sustainable future through natural / organic produced products. If you would like to know more about naturkost nord, please feel free to get in touch with us! Hier informieren wir über Aktuelles unserer regionalen Partnerhöfe. Sie erhalten außerdem Informationen zur Ernte, Hintergründe und Warenverfügbarkeit.